Christie Haupert helped Paddy Sullivan (University of Alaska) put in to his remote research site in Alaska’s Noatak National Preserve earlier this week. They flew in to Kotzebue and rode snowmachines on flagged paths to the Agashoshak River, from there traveling up river on the Aggie’s frozen surface until they reached Paddy’s site. Christie sent a note describing her adventures. Kotz was great. As we landed at this small community frozen into a tiny spit of land surrounded by sea ice, a snowmachine whizzed by a dog-sled team. I wondered, are they both off to get groceries, or maybe just to stretch their legs a bit? Welcome to the bush – I couldn’t help but smile. Our hosts were Lars and Meghan Nedwick, an amazingly super cool couple with a 4-year-old, Otto, and a 2-year-old, Arnie. Talk about HIGH ENERGY – whew, I was exhausted just hanging out in the kitchen. Give me 100 miles of skiing any day instead of trying to keep two young boys entertained when it’s -20 F and blowing outside. The Nedwicks put us up in their house. A warm, freshly baked spaghetti pie was waiting for us when we arrived, filled with fresh musk-ox meat from the neighbor. Paddy slept on the floor, I on the pull-out couch. 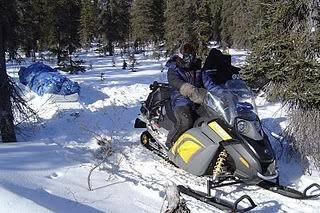 We snowmachined two rigs out to the site on the Agashoshak on Tuesday. There was just one mile of visibility when we left, but thanks to a well-wanded “road” system we didn’t lose our way. The Brooks Range, like much of the interior and northern Alaska, has suffered a very low snow year. There was not enough snow on the ground to travel across tundra so we stuck to just the river systems. This meant fun on ice. Paddy’s machine did some nice twirls along glare ice a few times. A bit more cautious, I managed not to spin doughnuts. Our home was a cozy 8’x8’ Arctic Oven, equipped with portable woodstove and all. Once we learned how to manage the stove and not smoke ourselves out of the tent each time we put on a log, it made for fairly comfortable accommodations – certainly the warmest winter accommodations I have stayed in away from line power. The mountaineer in me had a hard time truly relaxing, it felt almost too plush. It was weird not to travel via human power, not to carry everything on my back and mostly it was weird to have a heated tent to sit in at night. The next day, clear and sunny, was spent working on weather stations, including one that had been ravaged by a bear earlier in the fall, and digging snow “pits.” With a snow pack not much deeper than 40 cm, we didn’t really have to dig. Paddy is partly interested in how trees respond to different stressors – snowmelt, drought, etc. The snow pits help to characterize the snow conditions and to estimate the initial pulse of water the trees will receive at spring break-up. Paddy even commented that he hopes this year proves to be another drought, as it always results in interesting data. After a fitful night’s sleep resulting from -20 F temps and a popped luxury camp thermarest (always bring back up sleeping pad when winter camping), we arose to yet again brilliant sunshine, hopeful for an eventful day. We shuttled a few deep-cycle batteries to the new sites Paddy will outfit with weather stations this spring. The rest of the day was spent trying to get one of the two snowmachines started. Despite having it hooked up to a generator for more than six hours, it wouldn’t start. At 6:00p.m., we decided to abandon it and ride back together on the other snowmachine. My hope for an eventful day wasn’t quite what I imagined, sitting in a pristine area in the western Arctic listening to the drone of a small generator and trying to get a snowmachine started. The three-plus hour ride was tolerable, as it gave me a chance to just take in the scenery and not concentrate on the driving. My mind was mostly lost in thought about what we could have done to have avoided stranding a snowmachine. It turned out there was water in the gas tank; even the rescuers had to tow it back to Kotzebue and warm it up in a garage before it would start. Thankfully for my ego, it wasn’t user error. Friday was going to be my walk-about day, getting to know Kotz. Instead Lars Nedwick, who happens to fly for Bering Air, offered me the co-pilot seat on a trip to three nearby villages: Ambler, Kobuk, Shungnak. I couldn’t turn down that opportunity. We loaded up the Caravan with 1500 pounds of soda pop (not kidding) and five passengers. We stopped in Ambler to drop off some mail, then in Kobuk we dropped off most of the passengers. Shungnak was the recipient of the soda. We also had a State Trooper fly with us because in Shungnak there was a “perp” waiting in handcuffs to be escorted back to Kotz for an arraignment hearing. It was a real snapshot of village life. Crammed into five days I had at least five new experiences and learned a lot while I was out there. The folks that live in bush Alaska are really of a different breed. Good stuff.